Anyone prepping for the .22 distinguished badge ? Was online a few weeks ago trying to decide what I wanted to acquire for an iron sighted .22 to use since I do not own one. Thought about a new Marvel or Nelson conversion with the iron sight ribs. Nelson was out of theirs and marvel also. So thought there was a run on them to get prepped for the new .22 badge. Or maybe they were just plain sold out just because. I shoot a Marvel conversion with the scope rib so ordered the combo rib for it so can shoot with the irons and be able to mount the scope when needed which would be most of the time. So basically I purchased another .22 for the price of a combo rib. Anyone else dragging out their iron sighted .22's, buying a conversion or a combo rib ? Re: Anyone prepping for the .22 distinguished badge ? I signed up for Perry already, and yes, it says that this match will be on the 7th. Tuesday July 7, "CMP .22 Rimfire Pistol EIC". I just got off the phone with Christina at CMP and the Service Pistol EIC and CMP .22 Rimfire EIC will run back to back. jmdavis wrote: Tuesday July 7, "CMP .22 Rimfire Pistol EIC". I just got off the phone with Christina at CMP and the Service Pistol EIC and CMP .22 Rimfire EIC will run back to back. But no clarification of the allowable pistols/configurations for the .22 rimfire match? If I were running a CMP rimfire match, which I will be in the month of June, I would read the rules as disallowing the AW-93, the newer Pardinis, MG2 Benelli, etc. unless the recoil buffers had been removed. You guys are on your own about that. The rules for the .22 do not mention weight systems. I don't have a moveable weight system. Someone who does and cares should send an email with the question. As of now, I am going on the information that they are legal and that I need a .22lr pistol, without venting or compensator, with or without orthopedic grips, and with a trigger of 2 lbs. Before I disallowed them in a match, I would check carefully with CMP and make sure that my decision was correct. Just got an email from a friend who is at the CMP games Oklahoma. 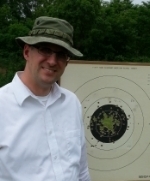 Mark Johnson of the CMP told him the AW-93 is not a legal gun for the CMP rimfire match. Do we think that Mark Johnson, off the top of his head, knows the details of the operation of an AW-93? Perhaps he does. But then again, if one words the question as "This pistol has a compensator, is it legal?" The answer will be no. If on the other hand the question is worded "This pistol uses a weight system to help control muzzle flip, is it legal?" the answer might be yes. Someone will contact CMP and get the official word. If I had an AW93, you can bet that I already would have. AW93 out because it uses sprung weights would mean Pardini Rapid Fire, SP1, SP-New, and SPBE out or some mental acrobatics to justify one weight system but deny another. At that point your attempt to attract people to international style shooting just banned the top gun of international shooting that seems rather short sighted. I am now about to head to the range and shoot airgun for an hour and my Pardini SP for 2 hours. The eastern games will be here before we know it. jmdavis wrote: Do we think that Mark Johnson, off the top of his head knows the details of the operation of an AW-93? Perhaps he does. But then again, if one words the question as "This pistol has a compensator is it legal." The answer will be no. If on the other hand the question is worded "This pistol uses a weight system to help control muzzle flip, is it legal" the answer might be yes. Someone will contact CMP and get the official word. If I had an AW93, you can bet that I already would have. AW93 out would mean Pardini Rapid Fire, SP1, SP-New, and SPBE out or some mental acrobatics to justify one weight system but deny another. At that point your attempt to attract people to international style shooting just banned the top gun of international shooting that seems rather short sighted. This match was intended for simple rack grade pistols that anyone can buy at a reasonable price, not fancy target pistols set up for Olympic competition. What part of *no recoil buffers* do you want to argue with? Schaumannk wrote: This match was intended for simple rack grade pistols that anyone can buy at a reasonable price, not fancy target pistols set up for Olympic competition. Where does it say no recoil buffers? I use a Nelson conversion so I don't have a horse in this race but I do care about clarity and the rules are simply not clear. Whenever you can assume what was or was not meant you have problems. If they would have left out "operating in a similar manner" and it would be clear - no recoil reduction, but they didn't so to me it implies gas operated recoil reduction. The CMP needs to clear this up before any matches, I'd be one pissed Pardini owner if I came to the match expecting to shoot and was denied. When was the last time that anyone used a rack grade pistol for CMP? It doesn't say, no recoil buffers. It also doesn't include weights, as do the rules for Service Pistols. If it really is for "rack grade pistol" why allow orthapedic grips? Heck, my High Standard Victor is as far from "Rack Grade" as my Benelli or Pardini. In each case they are precision pistols with match chambers. Each has been used in National, Olympic and bullseye competition for DECADES. My ball gun isn't rack grade, my service rifle isn't rack grade. But every single one of them meets the definitions of what is allowed by the competition. Gotta get to the range. A recoil reduction system is a pretty clear generic catch call. I believe that covers the AW-93 recoil system. That is all I need to know, and this has been confirmed by the guy running the CMP games in Oklahoma. Perhaps you would consider the secretary who answers the phone at Anniston more of an authority? Let me modify my previous comment. What part of "recoil reduction system" do you want to argue with, and why are you fixated on what it doesn't say, rather than what it does? The Feinwerkbau Model AW93 is a five-shot sporting pistol cal. .22 l.r..
Shooters from all over the world are enthusiastic of this sporting pistol. A returning of the system for balance of masses as well as an additional damper reduce the recoil of shooting considerably. At the same time a jumping up of the pistol is diminished by a special guiding device. Why anyone would assume that their pistol is fine, and just show up for a match (and be pissed) when everyone know that Modern Olympic style pistols are fitted with high tech recoil reduction systems, is beyond me. By all means clarify, but if you think the rules aren't going in the direction of only allowing rack grade guns, you haven't been paying attention to the CMP games match rules, or the recent changes to the NRA's production division. Neither do I Clarence, but I make my living reading and interpreting laws and regulations. I am quite happy to shoot my Marvel which is what I use for Bullseye anyway. I like my AW but it is a way different gun than a 1911 platform, and shooting it seems to hurt my scores in Center Fire and 45. Did not mean to start a fire storm with my thread here. But I will give my honest opinion on rules and regulations. People read into rules way too much and do not take them at face value. What pops into your mind when you read the rules as far as what is not allowed for the .22 EIC pistol ? Come on, if it reduces recoil or muzzle jump or wipes your azz, then it is not allowed, plain and simple. Human nature wants to use what we already have and not get something else to shoot a new venue, I get that, but all I did was buy a combo rib for my Marvel, simple. If you do not have a legal .22 pistol then buy one or improvise or do not enter the .22 EIC match, pure and simple. I will step down now. If they would have left out "operating in a similar manner" and it would be clear - no recoil reduction. Comps, venting, and porting all have one thing in common. They vent gas. The AW-93 does nothing similar. It would be a shame to disallow it simply for being an elegant design. We are talking about 22s and recoil reduction. Any auto loader has moving weight in the slide or it would be a single shot. This rule is clearly talking about venting gases. Part of the AW-93's elegant recoil system is a heavy spring operated compensator that fits underneath the entire length of the barrel. No amount of parsing of the rule is going to change either the intent, or the CMP's interpretation of that rule as it applies to the AW-93. As I read the rule, the Hammerli 208 is a legal gun for this match, but only if you shoot it without the barrel weights. As Clarence says, you can either argue about this, or get a gun within the rules and shoot. But if you show up at my match with an AW-93, you can either shoot my Marvel, or pout and go home. Your choice. I won't pout. I've got back up pistols. I'd just hate to see you disallow a legal gun. The AW-93 doesn't vent gas. Therefore, it's a legal gun. The disallowed feature is venting gas. I'm amazed that people read moving parts as recoil reduction. A slide moving on the Marvel is recoil reducing if you go by moving, sprung weight being disallowed. Either way, it's the Indian and not the arrow. The winners will be the same no matter what iron sighted pistols are used. Actually Kate, when I called today I spoke with Christina Roguski in Competitions, to have a specific question about the schedule for the 22 EIC answered, not the secretary that answers the phone in Anniston. I think that some people might want to actually read the new rules. The rules for the 22 specifically say "Any system of recoil control based on a compensator, barrel venting, barrel porting or other recoil reduction system operating in a similar manner"
The rules for the Service Pistol say: "Any system of recoil control based on a compensator, barrel venting, barrel porting, moveable weights or other recoil reduction system is not permitted. " The difference is obvious. Why would they specify weights in one but not the other if they didn't mean to specify for one and not the other. I'm with DRONNING on this one until I see a decision in writing. "The difference is obvious. Why would they specify weights in one but not the other if they didn't mean to specify for one and not the other. I'm with DRONNING on this one until I see a decision in writing." Because they didn't write the rules at the same time? I think the logical mistake you are making here, is assuming a compensator has to be gas operated. It doesn't. Free pistols have compensators, which are nothing more than weight systems to reduce muzzle flip. Yes, those gas operated compensators they use in IPSC are a special type of compensator, but they are by no means the only type. Weight system compensators have been around a lot longer. I have a feeling the reason they didn't specify legal guns and illegal guns, is that bullseye guns are customized to such an extent, it would be useless. They meant to prohibit recoil reduction systems of any type, and that is exactly what just came back from the CMP representative at the Oklahoma games today. I have to admit I read the new rule to regard only gas venting as well. It does seem odd that the CMP included this rule at all, for gas venting or otherwise. Outside of ISSF Rapid Fire it's not like the punishing recoil of the .22 LR is going to cost anyone points. It also seems odd to ban the Pardini and Feinwerkbau, which are the usual guns for Standard and Sport Pistol. I'm pretty sure the AW-93 can be fired without the compensator--is that also the case with the Pardini? Brian Mason wrote: I'm pretty sure the AW-93 can be fired without the compensator--is that also the case with the Pardini? I have fired my AW without the compensator. It is a totally different gun, very light in the muzzle end. I suspect almost anyone would prefer a Ruger or a 1911 conversion unit. I agree that a written clarification of the rules is in order. Committees who write these things, seldom "what if " them all the way through. Look at the bright side, at least it isn't 2000 plus pages like Obamacare. So, very old school. Is this model 106 a pistol with a barrel weight? Or, a pistol with a removable weight that is used for recoil reduction/barrel flip? I agree that both the Aw93 and the hi standard shown above are legal as they don't use vented gasses to reduce recoil. A side goal of the .22 badge seems to be generating interest in international pistol. Banning those guns would defeat that purpose.